The center of this composite image shows four large galaxies that are colliding and will ultimately merge. This four-way collision is occurring in a giant cluster of galaxies, called CL0958+4702, located nearly five billion light years away. 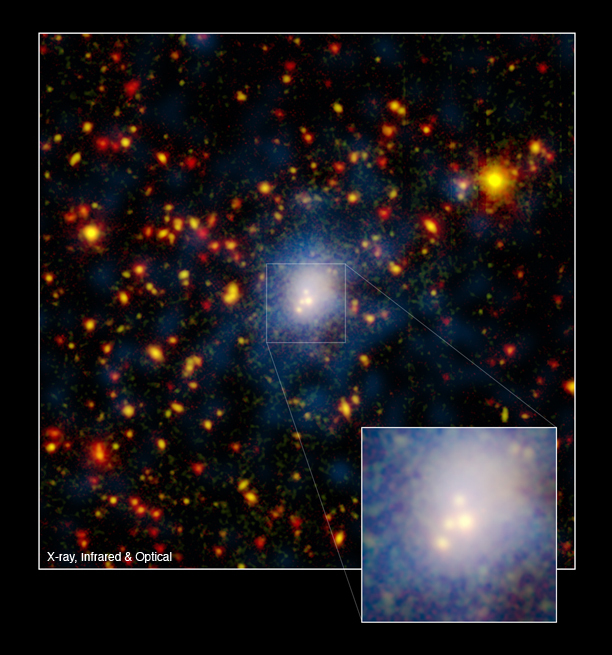 Infrared data from the Spitzer Space Telescope are shown in red, visible light data from the WIYN telescope are green, and X-rays from the Chandra X-ray Observatory appear in blue. The Chandra data show hot hydrogen gas at temperatures of a few million degrees. 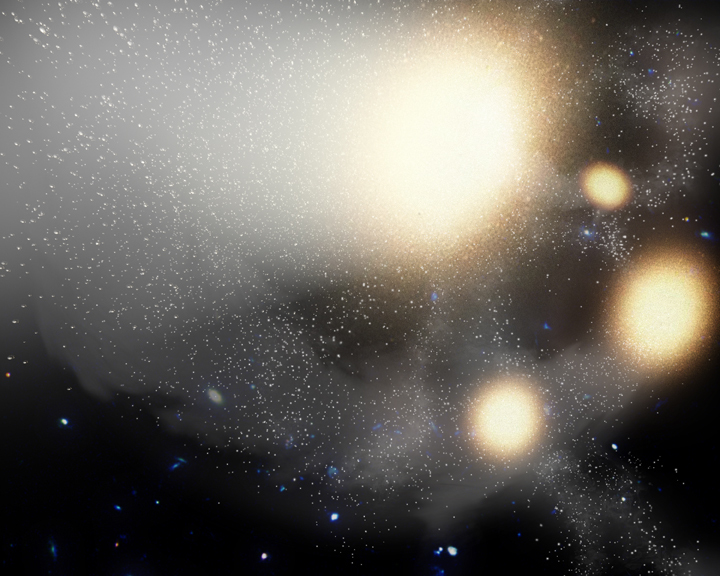 The temperature of this gas tells astronomers how much the cluster weighs. CL0958+4702 is more massive than the Virgo cluster (the nearest cluster) and less massive than the Coma cluster (a nearby giant cluster). The cloud around the colliding galaxies contains billions of stars tossed out during the messy encounter. When green and red overlap in this image, the color becomes orange or yellow as with the galaxies containing many older stars. When all of the colors are present, the objects appear white. The dots in the picture are a combination of galaxies in the cluster; background galaxies located behind the cluster; and foreground stars in our own Milky Way galaxy. Coordinates (J2000) RA 09h 58m 19.30s | Dec +47° 02´ 17.00"